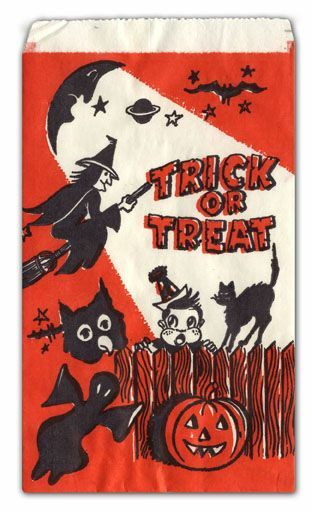 I have vivid memories of trick or treating on Halloween as a little girl - in a costume and carrying either a plastic pumpkin to fill with treats - or later a pillowcase that would be full of candy by the end of the night. I wondered when the practice of trick or treat started. It seemed like a baby boomer invention to me ... so I looked to see what I could find. Trick or treating became popular a bit earlier than I thought! 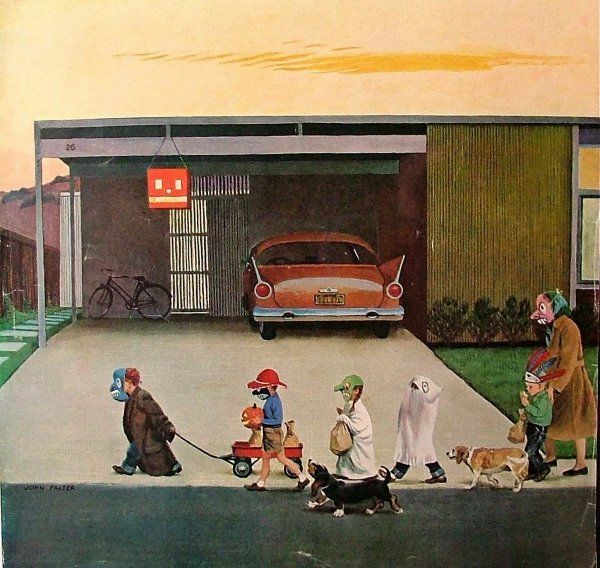 Knocking on doors on Halloween night to receive candy from neighbors became popular in the 1930's in the United States and Canada. It was originally popular in the western states, and then moved eastward The term "trick or treat" was first used in the Oregon Journal in 1934. Trick or treating hit a problem in the 1940's because of sugar rationing during World War II. It picked back up with great enthusiasm in 1947. 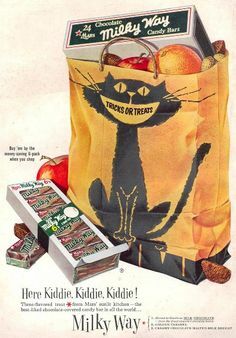 Many October 1947 children's magazines featured trick or treat covers and trick or treat candy began to be featured in magazine advertisements, like the Milky Way ad from 1947, pictured below. Trick or treating was popular in tv shows and children's books during the 1950's and 1960's. The first Peanuts comic strip depicting trick or treating appeared in 1951. Later, in 1966, Charles Schulz would create It's the Great Pumpkin, Charlie Brown, a Halloween classic for children. Halloween candy sales average about 2 billion dollars annually in the United States. It is now the second most commercially popular holiday in the United States - after Christmas. I love the vintage magazine illustration below, which depicts a 1950's family trick or treating -- even Mom is wearing a mask. They are out in daylight (early evening), with their faithful basset hound and beagle to help -- and a Radio Flyer wagon full of treats. What do you remember about trick or treating? I would love to hear from you in the comments, below. I didn't realize trick or treating was that recent! Great post! So interesting. I remember a ghost costume (sheet with holes) that was all muddy from traipsing about. Love those pictures. I remember having a plastic pumpkin for trick or treating, and my mom or dad always went with. We always walked. No wagon for us . Thanks! I really appreciate your comments. I've never been trick or treating!! But I can definitely see how they would make so much money on the candy! !